Leading the line up on Booth C31486 is Atlas Copco’s new QAS generator range that is designed specifically for the needs of the US market. The range has been completely overhauled and incorporates eight models covering power ratings from 25-330 kVA. All QAS generators include the latest Tier 4 Final engine and have a footprint that is up to 25% smaller than the previous generation. Atlas Copco will also launch three new PAS diesel pumps at CONEXPO. With an outlet of 4.6 or 8 inches, the high capacity diaphragm pumps have a pumping head of up to 180 ft. and accommodate flows of up to 3650 gallons per minute. Visitors will be able to learn about the pumps’ extended range of new features that are designed to maximise efficiency and minimise fuel consumption. Over the next 12 months Atlas Copco is replacing its popular WEDA electric range with the WEDA+ range. The new WEDA+ 50 and 60 models will be launched at CONEXPO. 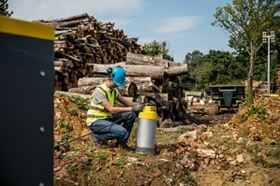 Portable compressors will also feature prominently at CONEXPO, with several models from Atlas Copco’s XAS range to be exhibited. This includes the flagship XAS 185, which has recently been re-designed to include the latest Tier 4 Final engine.